MCCC science students and faculty attended a forensics seminar on Nov. 14, presented as part of the 2006 Eastern Analytical Symposium (EAS) held Nov. 13-16 at the Garden State Convention Center. Sponsored by BASF Catalysts LLC, Bristol-Myers Squibb, Cardinal Health and L'Oreal, the theme of this annual symposium was "Celebrating the Diversity of Science." Mercer students attended the one-day session entitled "Analytical Chemistry and Forensic." Students learned about the variety of analytical tools used in forensic toxicology, including strategies to detect poisons and drugs in the human body, as well as the significant achievements and relevancy of DNA typing for crime scene investigations. Pictured at the 2006 EAS are: (front row, l. to r.) Virlyn Gibson, Assoc. 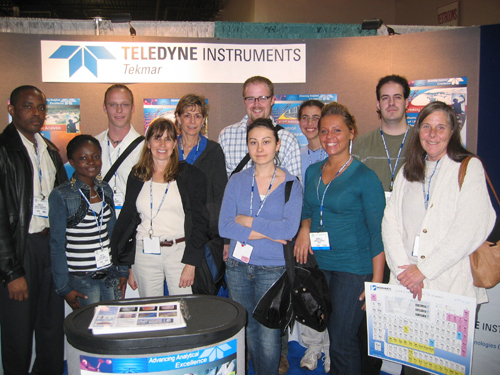 Prof. Laura Blinderman, Tamara Rehl, Danielle Herold and Judy Athmejvar; (back row, l. to r.) Kingsley Anabaronye, Tim Klockner, Assoc. Prof. Helen Tanzini, Christopher Bennett, Katie Hume and Anthony Suarez.